You are correct, the three on the left are Italian, post WWII. The small bullion on black is a qual for some type of vehicle driver. The others will have to wait until I get home (at work right now) to consult my reference books. The slip-on looks Swedish or Finnish to me, I'm thinking an Infantry officer, 2Lt or Lt. I've got an unadorned one from trading with contingent troops while in Cyprus. I'll check back after supper. Cheers. 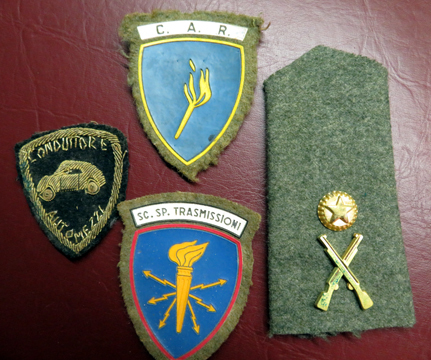 The two centre badges: top is for the Army Recruit Training Centre and the bottom is as Mike states, the Army Signals School. As for the slip-on, I'm leaning towards it being Swedish. Just my opinion, happy to be corrected.